Home Interviews Interview With Mr. Om Prakash, Director – InORBIT Tours Pvt. Ltd. When did you start your career in the Business Travel Industry? You pioneered the concept of trade fair tours in 1978, what was the idea behind it? Although I pioneered the Business Travel Concept in 1978, but the idea was born in 1972. Earlier I was owning a printing and packaging unit in Mumbai. It was in 1972 that I came across the news of DRUPA 72, world’s largest exhibition for Printing, Paper & Packaging. This was held in Dusseldorf Germany every 5 years. I managed to visit this Exhibition in 1972 as an individual visitor. The visit to Drupa 72 was an eye-opening experience, where the then leaders in printing technology from across the world displayed their latest machinery, materials and technology in more than 15 large halls. All the top names in printing technology were present. The exhibitors were required to keep their machines into full production for all days of the Exhibition. This would convince the prospective Buyers (Visitors) to examine Print quality, speed, and consumption of ink and additives in actual working condition.I could see the visitors of all nationalities from across the world, but the Indians were rarely seen. To know more I contacted the Organisors office to learn about the statistics. I was informed that over 1 lakh visitors from over 90 countries visited. Only a few Indians were registered. This provided a disappointing image of India, being the 2nd largest in population, but was virtually absent at the technology platform of the world. On my return to India, I met the then Consul General of Germany and the Director of Indo-German Chamber of Commerce with my plea, that they should promote the German Exhibitions and work towards sending large number of Indian visitors. They expressed their disappointment that inspite of their efforts, few individuals do visit, but not groups. I was quite for the next 3 years, but in the 4th year my conscious arose that I should take up this national cause to promote the exhibition for lager number of visitors. I promoted the next Exhibition for 1 year in advance. I could collect 43 members from all over India. I felt satisfied that with my efforts, 43 members will visit the German Exhibition. The thought was purely to benefit our country and there was no commercial angle in my efforts. This was the idea behind it. Kindly tell us about your company – InOrbit, briefly drawing a picture of the milestones it has crossed from the time it was established till today. I was encouraged by the German Organisors, The Indo-German Chamber of Commerce and other industrial Associations such as Plastics and Textile industries. I started promoting the exhibitions on my personal name (company was not born). The Indo-German Chamber provided whole hearted encouragement and willingly offered their name as “in cooperation of Indo-German Chamber of Commerce”. This provided a confidence in the industry as an individual, I was not known in the industry. The then Chief Minister of Maharashtra Mr. Vasant Dada Patil, appreciated my efforts and requested me to accompany his son Mr. Prakash V. Patil in such a mission to Interpack 78 in Germany. My selfless mission proved right, when the Chief Minister’s son returned with an idea and he set up a paper mill and a packaging box factory in Sangli – a town in Maharashtra. This provided a large capital investment and an employment to 200 local villagers. Indian Institute of Packaging (Govt. of India organisation) asked to donate all the packaging samples (2 large containers) collected from the German exhibition and arranged an exhibition in the Institute’s hall in Mumbai to show to all their members. 2 of my collected samples were picked up and as a result, they were manufactured in India. The pulp egg-tray – earlier eggs were sold and packed in handmade paper bags. This resulted into a large proportion of breakage of eggs. The pulp trays was a boon to the egg industry. The second item selected from my collection was see-through packaging for consumer products which was “blister packaging”. In a few years I expanded the scope of Business tours to many other industry products such as Engineering, Electronics, Chemicals, Machine Tools, Agriculture and others. It was in 1995 that I was conferred with Indo-German Award for my contribution to the development of bilateral Economic Relations by none-other less than Dr. Lothar Speath, the Prime Minister of B.W. Federal Republic of Germany. Other countries like Singapore, France, Italy, United Kingdom, Japan, Taiwan and Israel came to know about my dedicated Business Travel promotion, hence they encouraged me to promote their international trade exhibitions held in their countries. This expanded my horizon and I started successfully Business Travel groups of industry to the exhibitions held in these countries. As a result technology started flowing in India among the medium and small scale industries. On the other hand, countries like USA, Israel, Germany (repeatedly), China & The Indian Ministry started recognising my contribution to the Indian trade and industry and hence honoured me with highest AWARDS. 3. What are the services you offer and what attracts your clients towards these services? I tried to value-add to the visit of Indian industrialists apart from the visit to International Trade Exhibition, I organised visit to their respective products Factories in the countries of visits, such as; in Germany to Factories like BAYER, BASF, HEIDELBERG, VOLKS WAGON CARS, CONTINENTAL TYRES, RHEINCH POST, Newspapers, MERCEDES BENZ & BMW CARS and many more. Similarly DUPONT Factory in USA, ROCHE in France, AGRO PROCESSING Factories in Israel, IT Units in Singapore, Aluminium Factory in Thailand, Corrugated & Plastic manufacturing Factories in China & and many more. Plus meetings with Trade Associations and Chambers of Commerce. The biggest challenge was to spread the news of my business travel to each related industry in all over India. This was a massive task in those years when IT was not as today. I used to travel to many industrial cities and organised meetings through the Associations to provide their members the information of the Exhibitions and the travel facilities. I even provided Indian food in many countries, which was scarce. I started accompanying Indian Chefs to many countries especially for Indian Vegetarians & Jains. I also mixed sight-seeing in all the destinations so that it became Business mixed with Pleasure tours. What are the kinds of challenges you face while offering these services? The challenges faced are both in India and abroad. In India to reach the right people all over the country and to form a group in the specific time. To reserve the airline seats in large numbers as all the business visitors must arrive at the Exhibition on right date. Abroad to reserve the hotels, months in advance as the hotels rooms are sold out in advance for visitors from all over the world. Both India and abroad, it involves financial risks as all the reservations are done on our personal estimation. Sometimes they prove wrong, due to change in Govt. policy, imposing of taxes and excise duties, liberalisation or restrictions in imports or exhibitions which create impact on the business and industries. What fascinates you about travel? Are you also a traveller at heart? Travelling – Yes, I had a desire to travel abroad in my younger days as a student. Fortunately the travel profession provided me the opportunities to travel to many countries. I have practically travelled the world. I also became the motivating cause of travel to thousands of Indian people. You have been honoured with various prestigious titles including”Outstanding contribution in the promotion of Indo German Economic Relations” in Indo German Awards. Kindly tell us more about the other recognitions and what do they mean to you? Awards are always welcome in everybody’s life. They certainly provide motivation and encouragement. I have received numerous Awards in my career of 45 years, which include Awards from Germany, USA, China, Israel, Thailand etc. and in India from Ministry, Trade and Industry Associations, Social Publications and many more. However I had never worked with an expectation of getting Awards. I believe that one must work selflessly with a sincere motto to serve the community, cultivate humanitarian values. The Awards and rewards automatically follow in our life. My message to the younger generation is to give your best to the cause of benefitting others. In return you will always be rewarded. Germany is one of the most prominent countries when it comes to trade show industry and your ties with Germany are also quite strong. What major comparisons can you draw between the Exhibition Industries of Germany & India? This is a very good question. As you rightly said Germany is the leader in Exhibition industry. None of the other countries can compete with Germany. Planned Exhibition Venues in most cities, mainly outside the city with much space for exhibition halls and similar space for parking to the extent of 20000 car parking. More than 20 large halls in each major Exhibition Venue (each hall to the extent of 10000 to 15000 sq. meters). Huge height of the halls with sufficient Glass Ventilation for natural light. Underground lines in the halls for electricity/power/drainage/refuse of oils etc. Opening outlets every few meters. Hence no wires on ground. Every Hall has multiple high-rise gates for transport vehicles to bring in the machines etc. Every Hall has multi-cuisine sit-in restaurants. Plus mobile restaurants in the open ground and super market shop. Banks, Post Office, Tourists, Hotels, Sight-seeing counters. Glass covered walk-ways between halls. Electric shuttles transporting visitors to respective halls. Free shuttles from parking grounds to exhibition gates. Fire and Medical Centres in the Exhibition. Taxi stands, local buses, trams, trains connected to the exhibition gates. Conference and Seminar Halls attached. Help counters for Exhibition at all the airports & railway stations. I do not wish to criticise the Indian arrangements but the readers can evaluate with the German arrangements and feel the scope of improvements in all the areas, which India is lacking badly. I can only say that it is a long way for us to achieve German standards. In your opinion, what is the relevance and future of your services in the Exhibition Industry? In the course of my 45 years of service to the Exhibition industry, I feel that a lot more is required to be done in India. We have expanded our scope of services and apart from specialised travel services, we have added Events Division for providing services to Corporates in India and abroad. We have developed a team of specialists for handling of Corporate Events. I foresee a bright future for INORBIT TOURS and feel safe in the hands of the second generation, Mr. Tarun Malhotra, my nephew and our dedicated team placed in offices in major metro cities. Similarly I foresee the growth of Indian Exhibition industry in a big way, keeping in view the vision of our Prime Minister’s Make in India. Which are your 3 personal favourite trade shows globally & why? The reasons are Diversity into multiple products, industries, providing allied industry supports and capability to attract millions of trade visitors from more than 100 countries. These exhibitions meet the requirements of new entrant to major industry houses with solutions, innovations, latest developments and to change the shape of industry of future. What are your upcoming plans for InOrbit? 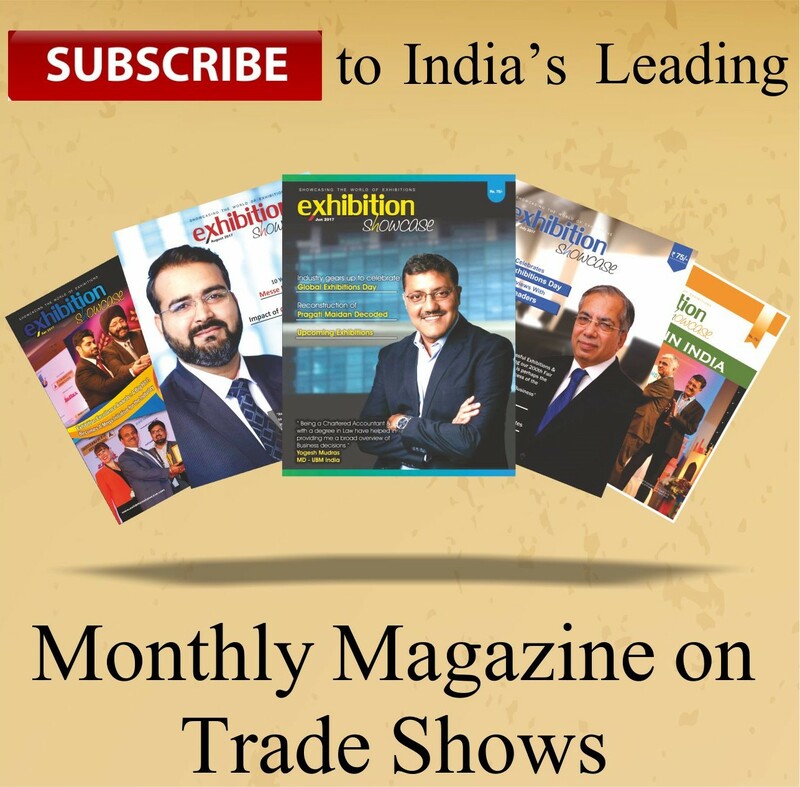 To expand the existing mode of Exhibitions Business and to diversify to support Indian Exporters to provide services in 3rd world countries Exhibitions in countries like Africa, Latin America & Gulf countries to promote Indian products and their exports. As an individual, I have contributed 45 years of my active life to the cause of Exhibitions all over the world. I enjoy the satisfaction and good wishes of large number of Indian manufacturers who initially travelled with me as Visitors to Global Exhibitions. They imported machinery, technological know-how, some entered in joint ventures and now they have converted from Indian visitors to Indian Exhibitors. They attribute their success to my efforts in motivating them to visit such industry exhibitions. I feel this has been my contribution to the Indian trade & industry which is now on its way as a developed country. After 45 years of my contribution and at the age of 78 years, I still love my work and enjoy the passion and be at my desk full day. I invite the younger generation to upgrade their knowledge of Exhibitions worldwide. I would like to give back the experience what the life has been kind to me and that I have learnt in 45 years.